This IS the dinner you have been looking for! 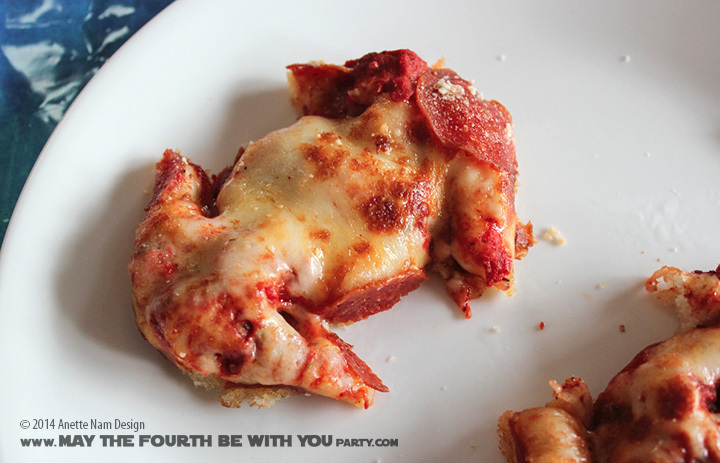 Seriously, simplest Star Wars meal ever! Yet, this might be one that makes the kids and adults the happiest! Watch Robot Chicken Star Wars 1 while you wait for pizza to arrive – you’ll have just enough time. Cut the pizza in as many ships you can fit. Make the crust lover in your life very happy, when he gets all the left over edges. We tried making a diorama with a round pizza (Death Star) in the middle. It didn’t look very good. The kids especially, were happier just receiving a plate with a tie fighter or millennium falcon shaped pizza on it. Williams Sonoma no longer sells this item, but you should be able to find it on ebay.